Plot 3D data on a 2D plot by using color to display the values of the third dimension. For example, you can use an intensity graph to display patterned data, such as terrain, where the magnitude represents altitude. What Types of Data Can I Plot? 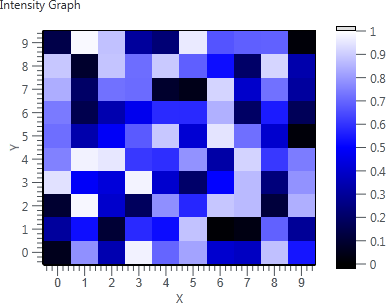 Intensity graphs accept 2D arrays of numeric values. Each number in the array represents a specific color. The array indexes correspond to the center of the color block. The row index of the array is the x-value, and the column index of the array is the y-value. The color block has a unit area, which is the area between the two points, as defined by the array indexes. Rows of the array appear as columns on the graph and vice-versa. If you want rows to appear as rows on the graph, use Transpose 2D Array before wiring the array to the graph. When you set the color mapping for an intensity graph, you configure the color scale of the graph. The color scale consists of at least two markers, each with a numeric value and a corresponding display color. The colors displayed on an intensity graph correspond to the numeric values associated with the specified colors. Color mapping is useful for visually indicating data ranges, such as when plot data exceeds a threshold value. Click Color scale on the Item tab to set the color mapping. Lower and upper out-of-range colors are specified as High color and Low color and are displayed on the graph.